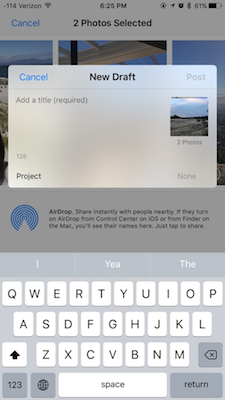 By using native sharing extensions on both iOS and Android, you can share photos and attachments from your device directly into Fieldlens posts. 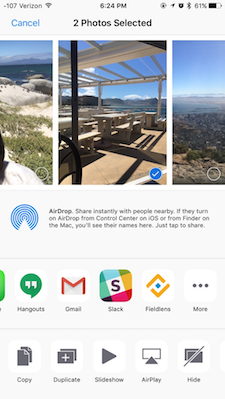 From your Photo Gallery or while viewing an attachment, select the standard share icon on the bottom left. Choose Fieldlens from the presented share options. If you don’t see the Fieldlens icon, press the "..." menu, and turn on Fieldlens from the Activities page. Enter a title and choose the appropriate project from your project list. When ready, hit Post to upload to Fieldlens. This will create a draft in the selected project. You can then open Fieldlens on your device, navigate to the draft, and complete the rest of the post details. You’ll also use the native share button to do this on your Android device (these will vary by device). Choose Fieldlens from the options, and select the appropriate project. At this point, however, you’ll be brought directly into a new post form to complete the post details. This will NOT create a draft on Android but will post directly to the project Feed.